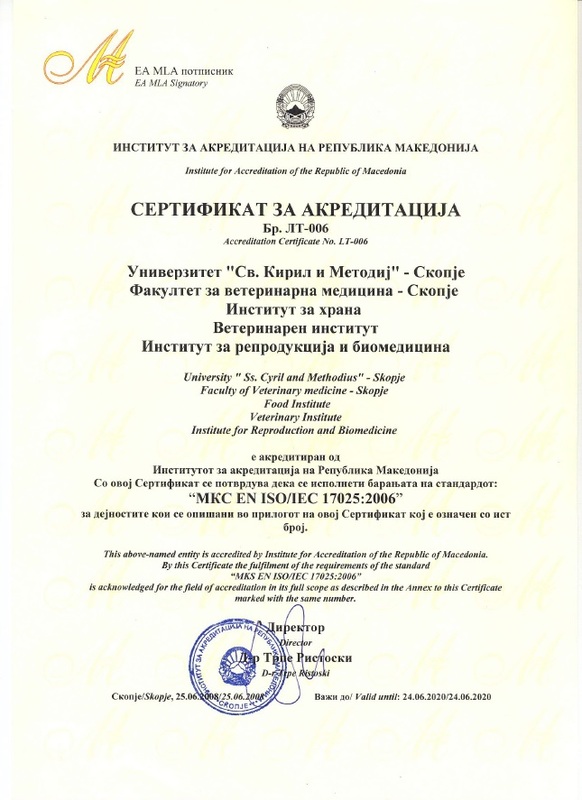 Within the application activities, on the Faculty of veterinary medicine in Skopje (FVMS), well equipped laboratories are functioning. They all fulfill different requirements to external customers. FVMS basic commitment is to increase the quality of service, production and testing, as well as customer satisfaction and national and international legal requirements of competent authorities. Therefore, a priority commitment of the management team of FVMS is the introduction of management systems and quality control. The system for managing quality requirements according the International Standard MKC EN ISO 9001:2008 in the FVMS was introduced and certified on 02/05/2005 by the international certification body BSI (British Standard Institution – Cert. No. 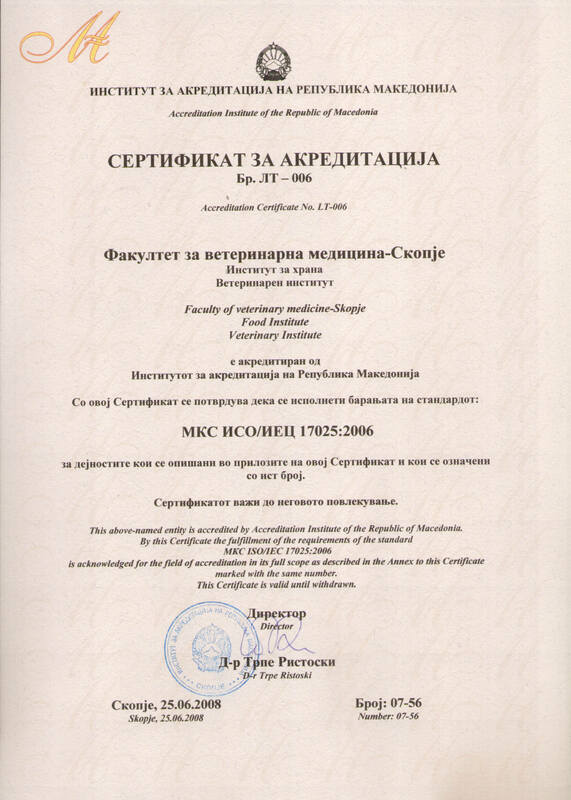 FS 74597), recertified on 26.03.2008, with the final validity till 01.03.2014. 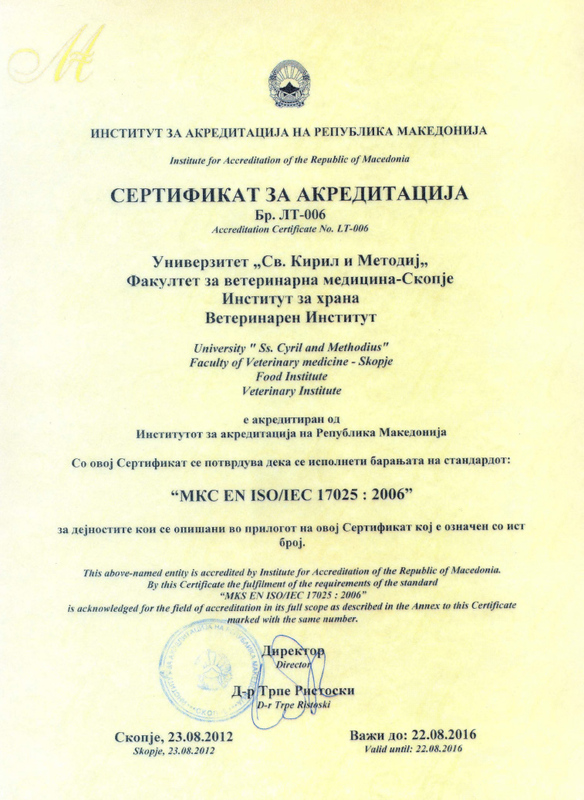 FVMS (Institute for food and Veterinary institute) is accredited by the Institute for Accreditation of R.Macedonia (certificate.no. LT-006), which confirms that the requirements of the international standard „МКС EN ISO/IEC 17025:2006” in the field of testing food products, beverages, water and examination of animal diseases are fulfilled. Implementation of international standards „МКС EN ISO/IEC 17025:2006” in the Institute for food and Veterinary institute in the FVMS for our customers means a guarantee for the reliability of results for all samples tested within the same. That is also the guarantee that tests will be conducted in accordance with the latest national and international standards and regulations. FVMS will also maintain a high level of reliability to customers for testing results, and high level of services depending on the customer requirements. Accredited laboratories of FMVS are proposed to be “National Reference Laboratory” for control of food safety and monitoring of residues, zoonoses and antimicrobial resistance, as provided in Regulation EC/882/2004. In its vision and mission, FVMS unequivocally states that it will be competitive, internationally accredited laboratory that performs routine tests to monitor food safety, animal health and welfare in their varieties in R. Macedonia.